Our daughter Jess was having a dinner party tonight and wanted a recipe for scallops. The Kitchen Genius came up with a new recipe for scallops recently that made me want to lick the plate. As embarrassing as it is to admit, I did run my finger across my empty plate when no one was looking for one last taste of this amazing sauce. Seriously, it was that good. I love scallops, but for years cooking them intimidated me. It doesn’t take much to overcook them and if you do, the tender morsels turn into rubbery hockey pucks. Luckily for me, KG is an expert at cooking scallops and showed me how it’s done. The trick is to sear them over medium high heat, making sure you don’t overcrowd the pan. I know from experience if you crowd the scallops they will never turn a nice golden brown. And trust me, you want that lovely golden shade, not just for eye appeal, but because scallops are naturally sweet and searing them properly caramelizes the surface to bring out the best flavor. So make sure your scallops don’t touch each other while they’re cooking. It’s a bit like taking a car trip with kids – you want to give them enough space so they don’t drive you crazy. Even though it takes slightly more planning, it’s more than worth it. The most important kitchen tool for this dinner (and many others) is a handy dandy pair of spring release tongs. If you don't have a pair (or three) go out and buy some now. They’re as precise as fingers but they don’t burn when they touch hot food. You will use them to flip the scallops and move them to the baking dish. And then you will be amazed at how many other things these babies can do. Have I mentioned how good this sauce is? It bears repeating, because sauces are another thing that used to intimidate me. I grew up eating gravy, not delectable sauces, so this is not a natural for me. I’m still learning, but even after all these years I watch in awe as that man whips together dishes like this. We served the scallops on top of a turnip puree with a side salad. Our daughter replicated that exact meal tonight and I just got off the phone with her. She was impressed by how easy this was to make (perfect when you have a house full of guests) – and yet it was so tasty that everyone was impressed with her culinary skills. Pat scallops dry with paper towel. Season with salt and pepper to taste. Heat a large skillet over medium high heat. Add 1 tablespoon butter and olive oil. In small batches making sure they don’t touch in the pan, sear scallops 2 to 3 minutes per side until brown, but still medium rare inside. Use tongs to flip them. Place seared scallops in a baking dish and continue until all scallops are seared. Turn heat down to medium low and add 1 tablespoon butter, lemon juice, zest, thyme, and honey. Cook, whisking constantly until thickened, about five minutes. Add the last tablespoon of butter and whisk briskly. Drizzle sauce over scallops and bake in 350 degree oven for 5 – 7 minutes until heated through, but still tender. 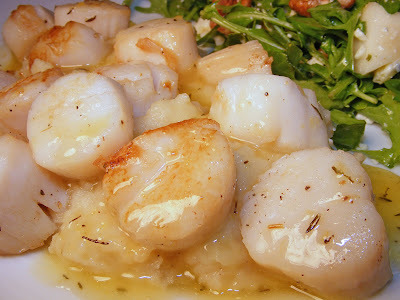 It looks fab- scallop's are my husband's favorite, so maybe I'll surprise him with these for a date night! Is the turnip puree just mashed turnips, or is there cream/butter/herbs/spices/&c? Good grief, woman...my arse is expanding just reading this blog! Beautiful. I love scallops and yes you can't crowd the pan, it makes a difference. You evil woman you! LOL These look decadant. 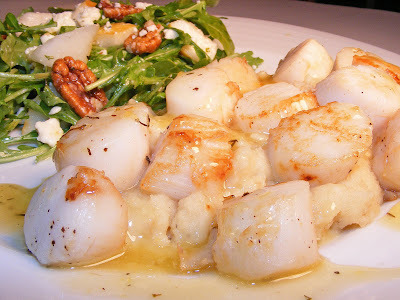 I think you should have a dinner party, invite me, make KG cook us up a mess of these scallops! Sounds like a plan? Ah, one of my favorite foods!! I love scallops and I'm with you, it took me a long time to start cooking them. Now I make them all the time and this looks terrific!! Oooh those scallops are enough to drive us wildly insane. These look amazing! I've never cooked scallops at home, just eaten them out. But this recipe would be a great way to try some at home. Hey...I wonder if I could pop them into the Easy Bake? They look perfect-and so delicious, the sauce is lovely! My heart is hankering for them, now. Don't laugh at me... I'm drooling as steadily over the turnip puree as I am over the scallops! lemon thyme drizzle?! that sounds amazing! This is a really nice recipe and so fancy too. I did not know that about not crownding the scallops, now ee I would have crowded them in a rush to get done! Great tips- thanks! Yes the sauce does sound heavenly. Eeks- I was all thumbs on my comment. It's early yet! Did you get the Artisan book yet? What will you make first? Pumpkin - The turnip puree was made by roasting diced turnips (with a drizzle of olive oil) in the oven. When they're tender, just mash them up. Katherine - That sounds like a most excellent plan! Cookie - If you're going to use the Easy Bake Oven, I'd switch to the tiny bay scallops. LOL. Robin Sue - I just got the Artisan bread book yesterday! Can't wait to try it. just found this recipe (this was posted awhile ago, i know) but was wondering what the benefits are to baking them after searing them? Could I just sear them a little longer, pour the sauce over and serve? This is the first time I have made scallops. Sure am glad I found your recipe. It is SO easy, and SOOO divine. Oh My!! PS - thanks for the sauce recipe, sounds good, I'll try it tonight.